Are you shocked to not see a traditional poundcake staring back at you? Don't fret. This Orange Pound Cake can be made in a loaf pan and served sliced OR you can get creative like I did and make it into a cake, you know, a pound CAKE. Why mess with something already so perfect? I will have to blame it on the pregnancy hormones. I have not been cooking a whole lot over the last three months. 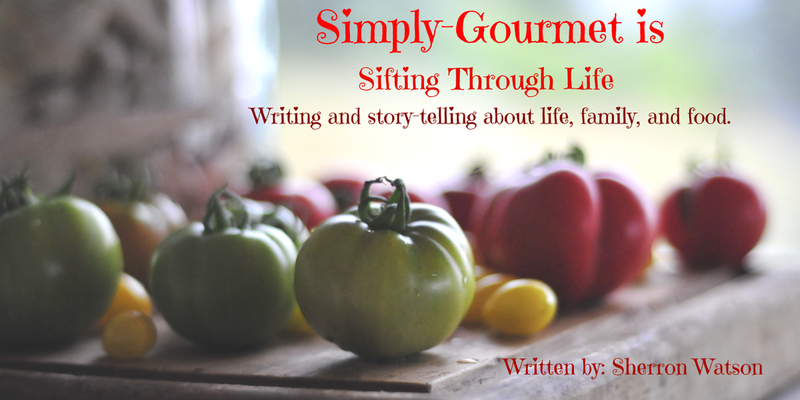 My creative juices were going wild when I finally could step back into the kitchen and see, smell and taste food. I wanted to do something fun for my family. I don't make a lot of cakes. Gluten free cake mixes are expensive and gf cakes from scratch don't always turn out for me. I found this Lemon Pound Cake recipe from The Baking Beauties and I was blown away. It tasted and felt just like a REAL pound cake. Our Sunday Supper theme this week is "citrus". I was excited because I love lemons, limes and oranges. One of my favorite Christmas candies is the chocolate orange that you WHACK on the table to slice. I thought to myself, could I make the pound cake into a cake and add chocolate fudge and achieve the same result: orange and chocolate yumminess? I think I have come close. Like I said earlier you can make this in a loaf pan or you can make the "cake" version and use 2 nine inch round cake pans. The cook time will be reduced slightly and you can embellish the cake with any toppings or frosting you want. I cannot wait for you to see all of the Citrus delights being shared by my friends for Sunday Supper this week. Our host is Jen from Juanita Cocina. The list of recipe links is below my recipe. I hope your weekend is going well. 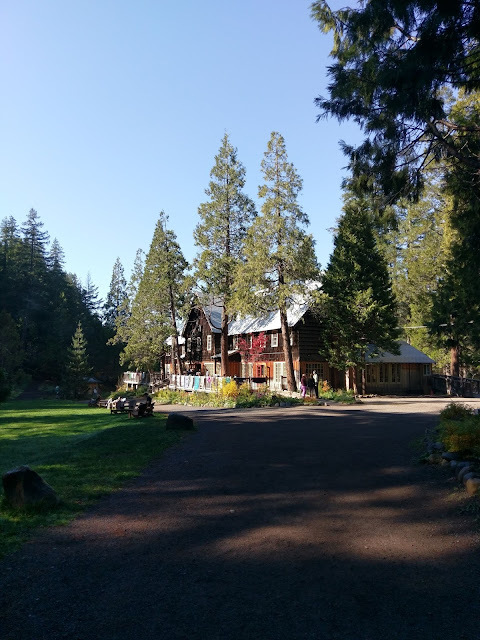 Ours has been wonderful with a visit from the Easter bunny, a few dozen boiled eggs and T-Bone Steaks. This is the first Easter dinner in 25 years I have not made a ham or leg of lamb. The family voted and this is what they wanted. I think it has a lot to do with our Spring like weather and the fact they want to be outside using the BBQ. It is just fine with me as long as they are happy and we are together. 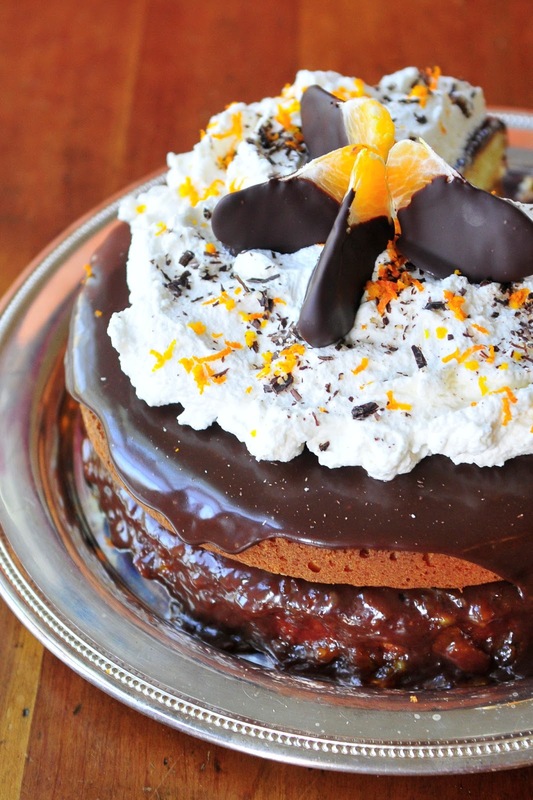 Toppings are optional: Cream for whipped cream, chocolate bar to grate, orange marmalade for cake, orange rind for zest, orange slices for dipped oranges, dark chocolate chips to dip orange slices in and hot fudge sauce. HOT FUDGE SAUCE: 1 can of condense milk, 1 stick of butter and 1 cup of chocolate chips. Combine in a pan and warm. Stir to combine. Serve on cake, ice cream or use to dip fruit. Preheat oven to 325. If using a loaf pan, line with parchment and spray ends of pan. If using the 2 round nine inch cake pans, cut circles of parchment paper for the bottom and spray the sides. In a large bowl, combine all of the dry ingredients and whisk well. In a separate bowl, add sugar and butter. Beat for 4 minutes until light yellow. Add one egg at a time to the butter/sugar mixture, combine well after the addition of each egg. Add vanilla. Alternate the orange juice/milk and dry ingredients when blending in with the egg/butter/sugar mixture. The batter will be thick. Add to the prepared loaf pan or distribute equal amounts of batter to the 2 cake pans. Bake the loaf pan for 60-65 minutes and the two cake pans for 40 minutes. A toothpick should come out clean. Let cool for 5 minutes and remove to cookie rack to finish cooling. To assemble the cake, they should be completely cool. Wrap well. The pound cake is good for 3-4 days on the counter. NOTE: It will get drier the longer it sits out. 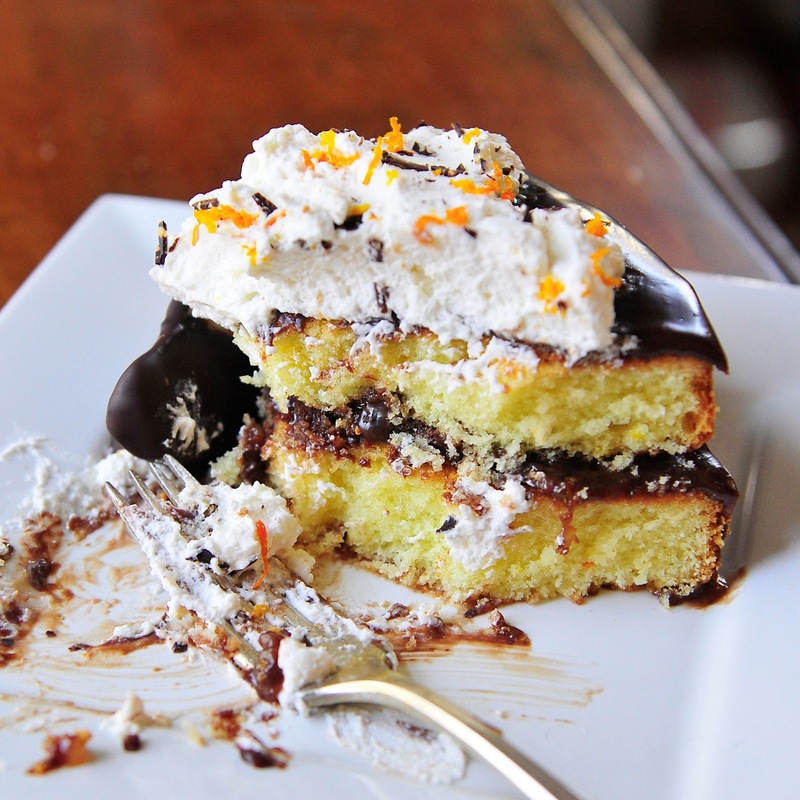 To make the orange slices: Dip orange slices into melted chocolate chips. Cool on parchment paper until ready to use. If in a hurry, you can put them in the fridge for 30 minutes to firm the chocolate. To assemble the cake: Place one cake round on bottom of cake plate, cover with chocolate fudge, add a layer of orange marmalade. Tip the second layer over and cover with fudge sauce and then add it to the top of the orange marmalade. Top the cake with fudge sauce (it will fall over the sides and the insides will ooze out from the center). Refrigerate until ready to serve. 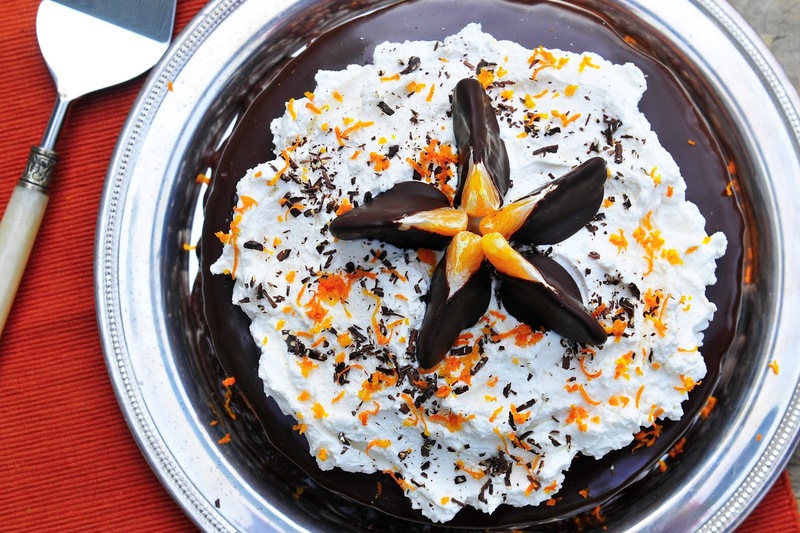 Remove and add whipped cream, shaved chocolate, orange zest and chocolate covered oranges. Sorry this picture below is not prettier but this shows you all the layers really well. Best looking pound cake I've seen in a while. How creative to make it into a layer cake. A pound cake cake? LOL! I love this! I love dark chocolate and orange. 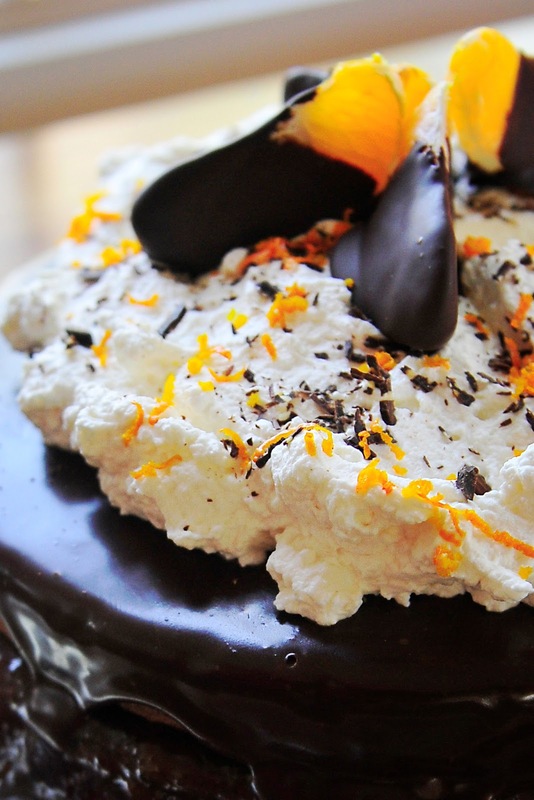 I would be the one stealing all those dipped oranges off the top of your gorgeous cake! It looks amazing! Happy Sunday! I'm going to make this right now!! Ah...this looks simply divine! I've never seen sweet rice flour before. Could you just use more regular rice flour and up the sugar content? Possibly Jaime although I have never tried it before. I use a brand that I find in Asian Super markets called Mochiko, if that helps. Simply gorgeous, Sherron! So much prettier than an ordinary pound cake! This is beautiful!! I want to dive into a piece! Oh my gosh, this is pure decadence! This is wickedly stunning. It's so pretty. That looks amazing! you might even convince me to give chocolate with orange another chance! WHOA MAMA! This cake is incredible! 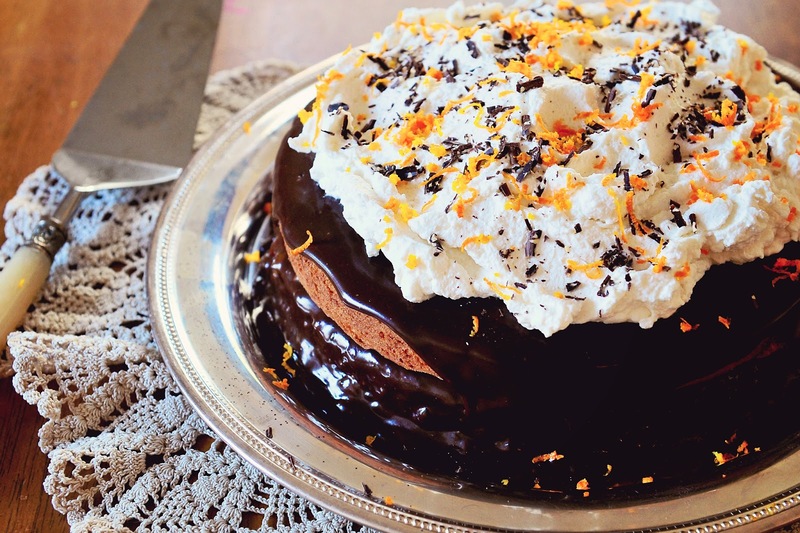 Fabulous job, Sherron - the cake looks so moist and way to go with the fudge sauce, marmalade and whipped cream. I would kill for a giant slab of this right now! Oh man I wish I had this recipe sooner, I would have made it for Easter! I'm sharing it with my GF friends! Thanks so much for posting! Wow! Now that is a pound cake even my husband, who doesn't understand why American's like it, would love. your cake looks gorgeous! 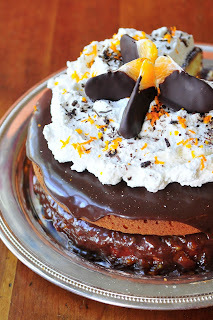 orange and chocolate make such a beautiful combinations! totally making me want some right now. Cut me a slice, I'm coming over! What a gorgeous cake! I can't believe it's gluten free... I have friends who are gluten free that would really enjoy this--and I would too! Looks and sounds so good ! Love the flour mixture you used in this. I've been eating GF for a month now & find it's helping my system. Not had cake so far, so I can make this. Hooking it to my GF cafe if that's OK with you. Pic with link that comes to your recipe. Usually it is triggered by the passion communicated in the post I looked at. And after this post "287. Orange Pound Cake (Gluten Free) #SundaySupper". some of these responses look like they are left by brain dead people? :-P And, if you are posting on additional online sites, I'd like to follow everything new you have to post. Could you list every one of all your community pages like your Facebook page, twitter feed, or linkedin profile?